I'm writing this from the DFW airport as we await our final flight to Alexandria and the waiting arms of our families! This will be the 14th flight in 20 days, having touched down in 8 countries. We have established 9 new film teams, 3 in the Philippines, 4 in Nepal and 2 in Pakistan. That makes a total of 28 teams in Asia – including the 18 in India and 1 in Sri Lanka. 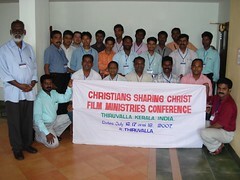 We have also met with all but 2 of the 18 film teams in India for a time of training and testimonies. It has been a worthwhile trip, but we are bushed and ready to be home. My last post left off with the second day of the conference. On the third and final day Patrick went over the CSC training manual with everyone present. While these teams are already functioning, it's good to go over the basics and make sure everyone is on the same page. We finished with a wonderful meal together at a table set for the King's kids, posed for group photos and spent time hugging and saying goodbye. The afternoon we headed out to Bro. Abraham's house for a brief visit and then on to Bro. Roy's home for supper. 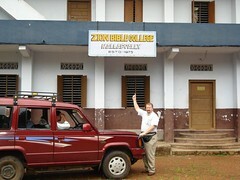 On the way we stopped in the town of Mallapolly to take a photo of a Bible school my father-in-law helped build before I ever met my wife. As huge as this world is, with billions of people, my father-in-law had financially supported a pastor in south India by the name of George Varghesi who, as it turns out, actually baptized Bro. Abraham's father and mother years ago! He is in heaven now but the Bible school continues. Bro. Abraham lives in a small home that his father built over 80 years ago on a rubber tree plantation. Rubber is his main source of income. Like Patrick, he is a businessman and helps underwrite some of the ministry in Asia. In fact, he gave a generous personal gift towards paying for the conference. 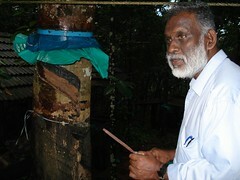 He showed us how to tap the rubber trees and the process that the rubber milk goes through before it can be sold to the rubber companies. After a snack in his home prepared by his lovely wife Susama we headed to Roy's home. Roy is married to Bro. 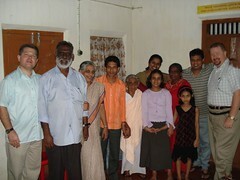 Abraham's daughter and is full-time in the ministry, traveling as an evangelist and also a CSC missionary. They prepared a lovely supper which we enjoyed with gusto before taking our leave. We had arranged the next morning to leave around 5:30 since it's a 3+ hour drive to the airport and we wanted to be there by 9:00, 2 hours before the flight left. It was a good thing we got an early start. 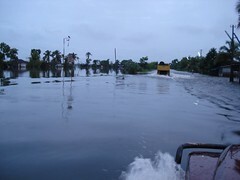 The heavy rains in Kerala had made the road we traveled in impassable. We had to double back and take some back mountain roads through higher ground. We made it just in the nick of time ... it also helped that the flight was delayed a bit! The next part is all a blur ... we flew into Delhi, rented a hotel room for a couple of hours to freshen up, then headed to the International airport for our 15+ hour flight to Chicago. We breezed through Immigration and Customs and headed to our connection flight to Dallas, where I'm writing this now. Thank you so much for your prayers, emails, encouragement and financial support. CSC is God's plan, not ours, and the expansion He is leading us to is happening at His direction. Bro. Patrick and Bro. Abraham both feel a strong conviction of the Lord that there will be over 100 teams in Asia in the next 5 years. As a member of the Board of Directors, I know CSC will carefully follow the Lord's leading in this and ALL matters. Thank you for being a part of the Christians Sharing Christ “Support Team”! Welcome Home Bro. Nathan!!!!! !Fred and I wish we could have been at the airport today to welcome you and Bro. Patrick back home but Fred is offshore and myself camps at LC. I looked forward to getting home daily and getting online to see and to hear about your trip and how our God was using you to further his kingdom. I am truly thankful that God brought you home safely to us and your family, Welcome home again and I will see you on Sunday!